Who Will Be the First Facebook President? The 2012 presidential race is beginning to take shape, and it is interesting to see how social media is being differently used by candidates. Obama kicked off his re-election campaign on YouTube and is at Facebook today with Zuckerberg to do a Facebook-style town-hall Q&A. Mitt Romney (R-MA) annouced his presidential bid on Twitter and Tim Pawlenty (R-MN) announced on Facebook and even created a Foursquare-style gaming layer where supporters earn points for participating in his campaign. I’ll be analyzing how social media is used throughout the 2012 cycle, but I’d like to start all of this with the question: who will be our first social media president? FDR became the radio president with his famous “fireside chats” and JFK the television president with his image-centered debates with Nixon. Many consider Obama the first social media president due to his massive fund raising and organizing efforts during the 2008 campaign using the web (though, Howard Dean was there four years earlier – remember his use of meetup.org). However, now that Obama has been in office for more than two years, has he really used the social web effectively in interesting new ways? The New York Times states that Obama treats the Internet like a “television without knobs,” using it primarily to simply upload videos for us to consume. Obama-as-president has thus far been a Web 1.0 leader instead of embracing the Web 2.0 ethic of users collaboratively and socially creating content. To put it another way, go to Obama’s Twitter account and ask yourself if he is really using the medium in an effective way? It is clearly ghostwritten and not at all in the style of mainstream Twitter users. In contrast, we can look at his opponents on the right. For example, looking at Sarah Palin’s Twitter account reveals that she uses the medium more in line with Twitter norms and appears to be Twitter-savvy in style. She better understands the medium compared to Obama (however, her more off-the-cuff style did get her in trouble over the shooting in Arizona earlier this year). All of this also speaks to the fact that the right has caught up (surpassed?) the left when it comes to utilizing social media politically. I am left with the question: when will we see a Web 2.0, social media president? Or will there emerge a candidate (or candidates) that can campaign and govern in line with social media? One that is “willing to wade into the messy digital fray and cede some control over their message”? 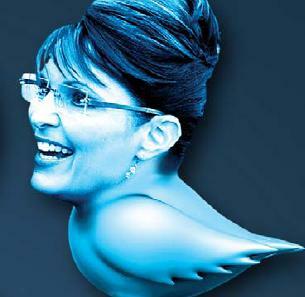 *Sarah Palin Twitter Bird photo comes from the Express newspaper out of DC. The Obama/Zuckerberg photo comes from the LATimes.